ALL MEMBERS OF SONGFACTS ARE MOST WELCOME TO PARTICIPATE. The greater the participation, the more diverse, and more representative our top ten list is. 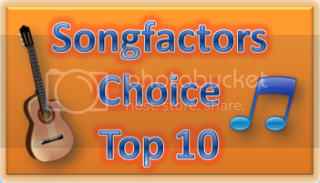 We'd like to invite everyone to help us select THE SONGFACTORS' CHOICE TOP TEN! Click here to view Every Song That's Made The Songfactors' Choice Top Tens (Artists). * When nominations close, choose your favorite Ten songs in order of preference from the Final Nominations and post them here. Points are allotted, 10 for your #1 song, 9 for #2, Etc. and our Top Ten is compiled from them. At the end of the voting period we'll announce The Songfactors' Choice Top Ten For that week. Naw, man, I'm going to California for spring break next week. Then you should be practicing this week. Yes, Tim - take it from me, you really do need to practice. Well dammit - I missed that. Ok, new nomination coming up. ... I'm going to California for spring break next week. And don't forget to bring condoms! They charge, like, ten bucks a piece for them down there! Hi, Y'all. I am partying in Cabo this week with some buddies. This is a wonderful place. These are my nominations. Wow Phil, I'm sooooo jealous!...Sounds like you're gonna have a great time there! I Can't Drive 55 ...Love this video! and it's a good tune too! Thanks, Laurie. Having a great time!